March 22nd 2018: Kickstarter Launch for new game development team: an 8 year old and his Dad. Dynamic team of London based Ethan and his Dad, Cris have are designing their first game, and have taken to crowdfunding site Kickstarter to try and fund it. Walthamstow, London, UK. 24th March 2018. Study after study suggest that getting kids coding is the best way to secure their future, but how do you engage a kid with reading difficulties in a world they can’t fully understand yet? Computer programmer Cris Thompson decided the way to get his young son involved is by taking on the coding tasks himself, while leaving the design, game planning and visuals up to his son. Dad: “We are making a game… It’s our first. 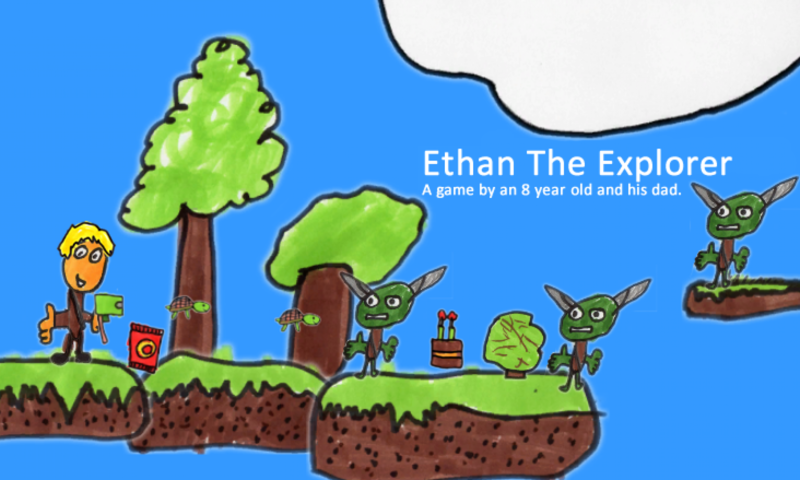 Dad Cris used to make up stories about Ethan the Explorer for his boys and this game will bring them to life. There will be time travel, pirates, dinosaurs, evil clones and at the same time they will create something together that will instil a sense hard work, seeing an idea through to a finished product.